Hurry! Entertainment Books for $5 – Not sure how long this will last! 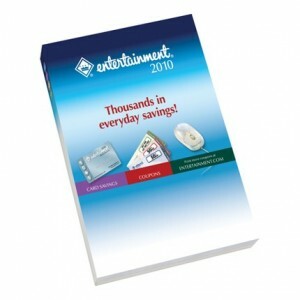 Here is a deal on the 2010 Entertainment book going on today (05/12/10) 05/18/10 and it’s possible that it might be extended – I just purchased the Entertainment 2010 book for $12 + FREE shipping and will get $7 back by purchasing through Shop at Home. That makes it only $5! Log in or sign up for a Shop at Home account. If you are a new member, you will receive a $5 bonus to your account. So for new users of Shop at Home, you could get this FREE after the bonus rewards. Choose the one that is $12 expires 05/18/10. If this ends early, choose the one that is just $15 expires 05/31/10. You will earn $7 cashback from Shop at Home either way! Either way you will get it for:$7, $5 or FREE! Entertainment books are a great way to save shopping, dining out, and other activities. Most of the coupons are a $/$$ or Buy One, Get Something Free coupons. If you use my referral link above, I’ll receive a bonus on your purchase thanks to you! I just got my book today! I’m so impressed with the number of coupons that are in there most of them are valid through November 1, 2010 and some even through December 31, 2010.